Toilet water pressure is governed by the type and style of bowl and tank you have. Standard flush toilets use a gravity flush system that releases water from the tank into the bowl below without the help of any outside force. For this reason, the pressure with which the standard toilet flushes is only adjustable to certain extent. Increasing your standard toilet flush pressure requires some basic checks, one mechanical adjustment and a few common tools to do the job. Turn off the water feed valve attached to the wall behind or near your toilet tank by turning the handle or knob in a clockwise direction. Flush the toilet once or twice to remove any water from the bowl. Scrub the rim of the siphon hole with a wire brush to remove any buildup that may be effecting flush performance. Fill the overflow valve in your toilet tank with vinegar and let it sit for about a half hour. 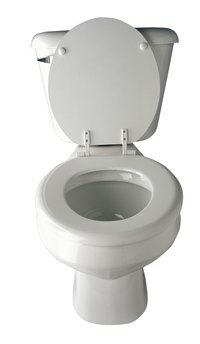 Locate the rim holes set beneath the toilet bowl rim inside your bowl base. Use a hand mirror to find and view the holes as you clean them. Slide a piece of 12-gauge electrical wire into each hole and strip away any calcium deposits you find there. If you are unable to clear all the calcium in this manner, use a small Allen key or screwdriver to scrape it away. Locate the float in your toilet tank. The float is attached to the fill valve, which brings fresh water into the tank and stops it when the float reaches the desired height. By increasing the water level, you can increase the force with which water enters the bowl base and flushes your system. There are several types of floats in modern standard toilets. If you have a ballcock system with a bendable float arm, bend it upward to increase the water level. If you have a float arm with a screw adjustment, turn the nut in a clockwise direction to increase the water level. If you have a sliding metal rod with a metal clamp as your float attachment, squeeze the clamp and slide it upward to raise the water level. While raising the water level will improve your flush power, raising it above the overflow valve will result in constant running and waste.